Happy Birthday greeting cards are very special for me. I am a person which loves to celebrate his birthday like the biggest personal day in the whole year. On the other hand, on his birthday everyone receives many greeting cards and it is important for yours to be the best. So, the first thing when I am starting to make a greeting card is to understand more about the person. 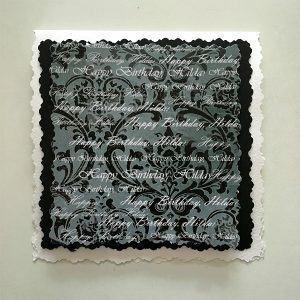 This greeting card was ordered for one of my favourite jazz singers, Hilda Kazasyan, who likes romantic decoration, but is a person who prefers very simple outfits. More often she wears black clothes, very elegant jewels from pearls, nothing big, very colourful or crying for attention. 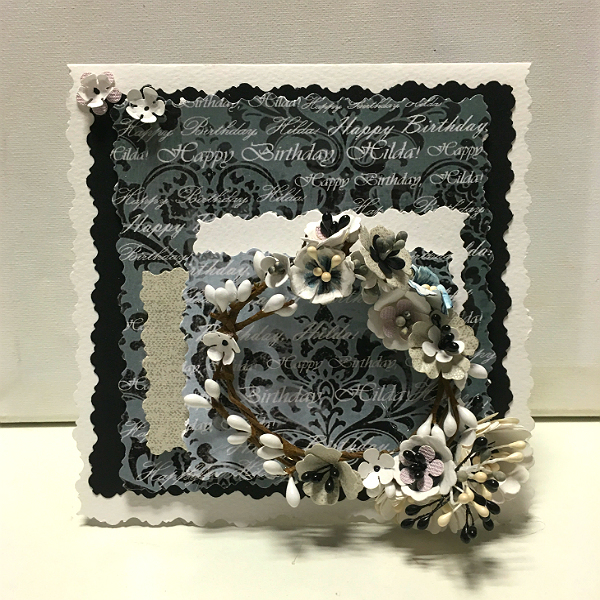 The lady who ordered the greeting card told me that the present should similarly be very simple – in grey, black and white pearls. 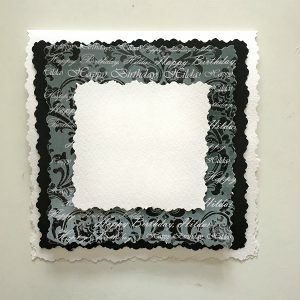 So the card must be in this style. 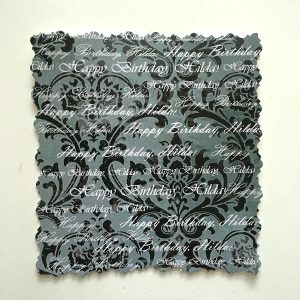 Grey and black are not my favourite colours for a woman’s greeting card, but that was my challenge. 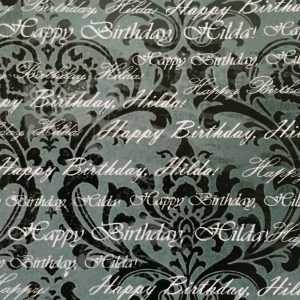 1.First I used the online editor Pixlr to create two papers in different grey shades and white letters, “Happy Birthday, Hilda!” – one light grey and one dark grey. Mixing different fonts made the design more attractive and maintained the grey-black-white concept. 2. After that I printed this foundation design on normal printing paper. Next step was to glue it with decoupage glue onto a high quality watercolour paper. 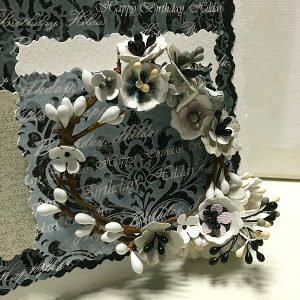 Gluing it on this paper made the image have a nice, a little bit vintage, texture rather than being plain. 3. After drying (not less than 4 hours) I used the designer scissors to make the shape I needed. 4. 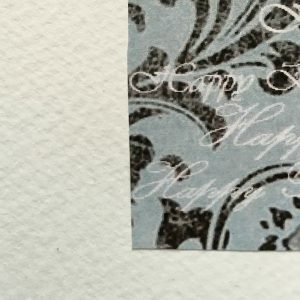 For the foundation of the greeting card I used the same watercolour paper, because of it very elegant texture. 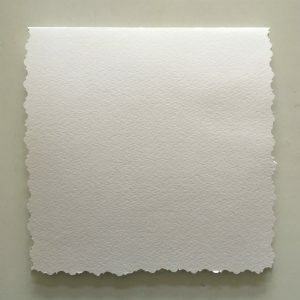 Imagining how beautiful the ink writing will look on this paper inside the greeting card! 5. 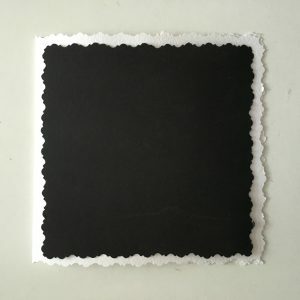 After that, with the same scissors I made a smaller black square – like a frame for the paper with the Birthday greeting. 6. Next I added the designers paper (from step 3). With these steps the foundation of the greeting card was finished. For the 3 dimensional decoration I have one very important rule, which has never let me down in all these years. Try, try, try! 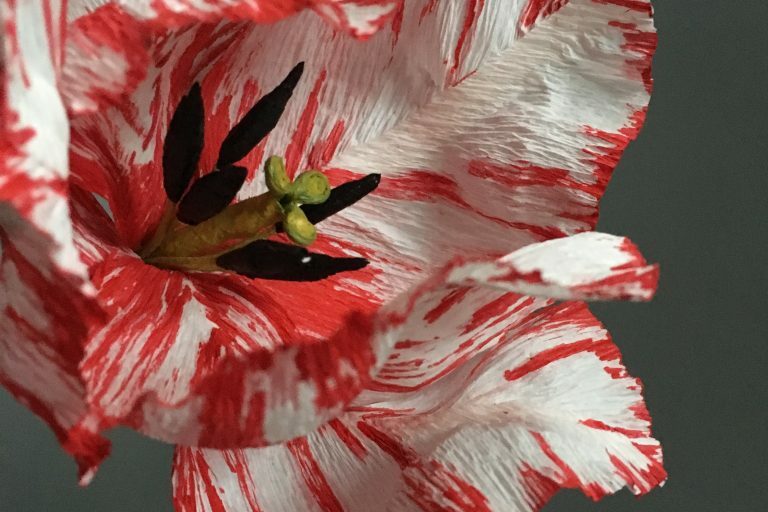 Even if you have a brilliant idea about the decoration, find two more and try them too. Very often things on paper do not look like you thought they might when you first start building them up. 7. The only thing I was sure of was the white square from the watercolour paper. It was a small light accent, corresponding with the main white foundation. But where to put it and how? 8. 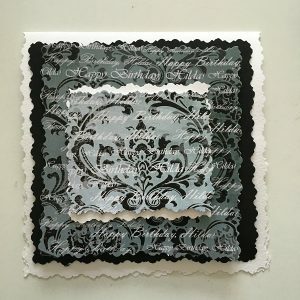 My first idea was to make a smaller square from the lighter grey paper and to glue it over the white one in the centre of the greeting card. But this made the Happy Birthday greeting card too ordinary. To move the white accent down-left was a little bit better and more interesting. But I still needed something more. 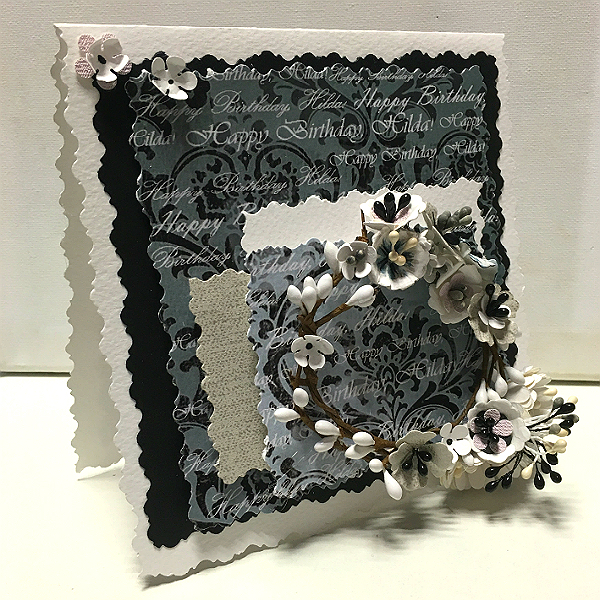 I decided to break the black-grey-white rule and give the greeting card a little bit more colour – very light, just a touch of blue, pink and beige. 9. 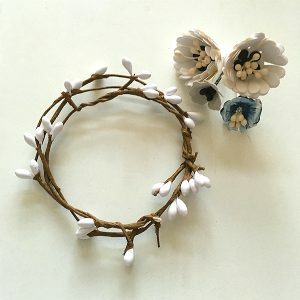 Using the wire spring branches I made a wreath. And used watercolour paper and light coloured paper like bluish and pinkish ones to create big and small flowers. 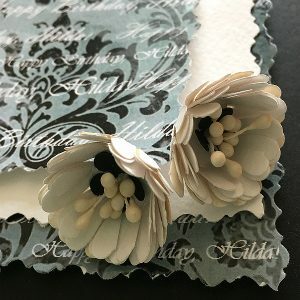 The flowers I made with one of my favourite Sizzix cutting flower shapes. 10. Before affixing the wreath and the flowers, I decorated the back side of the greeting card. This is another one of my small rules – Do not forget the back! 11. And after that I went back to the front. It is very important to glue the bigger flowers one level under the wreath, otherwise they will dominate the picture. 12. 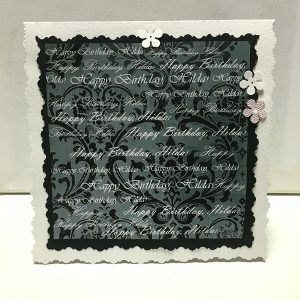 Finishing the design, I fixed on every small detail of the Happy Birthday greeting with hot silicone. And the Happy Birthday greeting card was ready! Materials: white watercolour paper, black cardboard for painting, printing paper, light blue and light pink cardboard, beige cardboard, beige, grey and black stamens, paper wire spring branches (you can make them by yourself), S-size Faber-Castell marker pen, Big shot cutter with flower cutting shapes, Pixlr.com online editor. Time: make it one day. 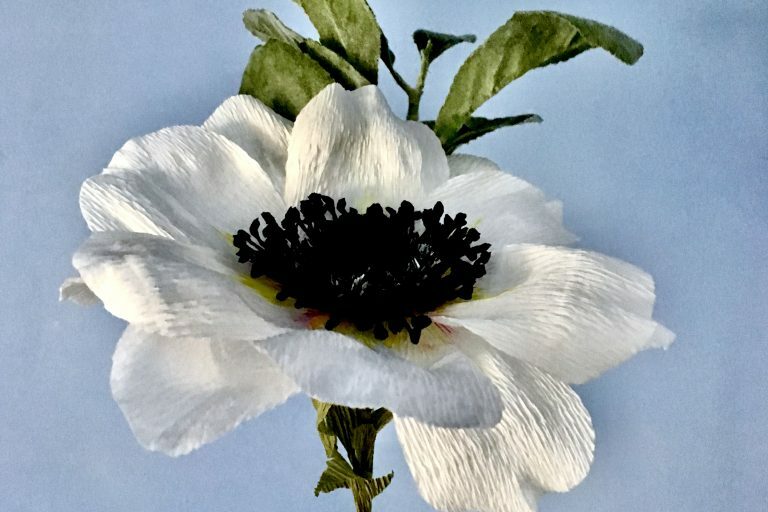 More paper flowers you can see HERE. Beautiful card! 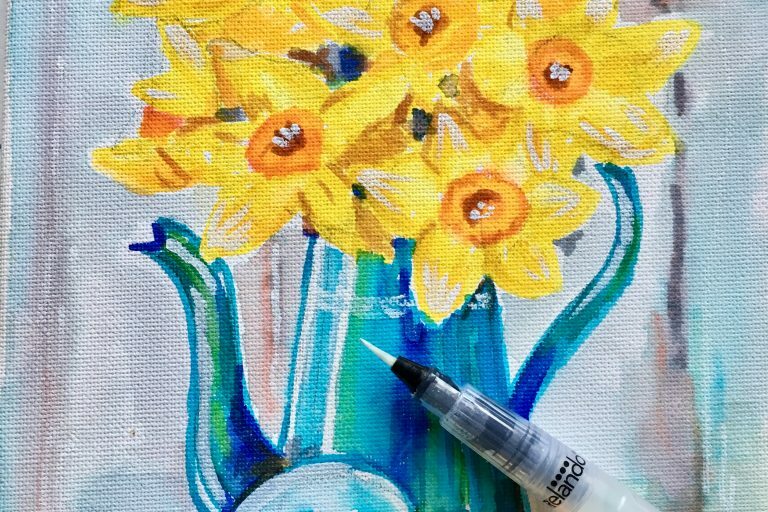 Happy new blog! Enjoy it and may it inspire many people to create!